As Australia are ready to visit India for T20I and ODI series, former India opener Sehwag has taken the banter to a whole new level with a hilarious TV ad for host broadcaster Star Sports. India vs Australia 2019: Always considered as one of the fiercest rivalries in the gentlemen’s game, India and Australia have given their fans plenty of moments to cherish on the cricket field. Apart from exciting and quality cricket, both the countries are known to provide enough fuel and fodder to the cricket lovers world over. India’s recent tour to Down Under (2018-19) was one of their most memorable outings in the southern land where the team created history by winning the Test and ODI series. However, the real highlight of the Test series was the friendly and hilarious banter between young Indian wicketkeeper Rishabh Pant and Aussie captain Tim Paine. Both of them impressed their fans by taking some extremely funny digs at each other when they came out to bat. 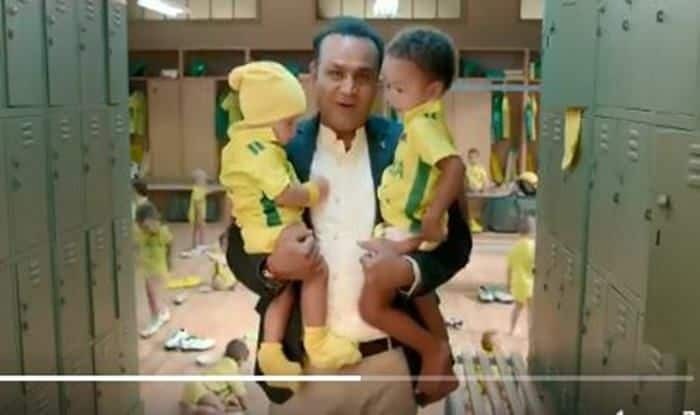 Now as Australia are ready to visit India for T20I and ODI series, former India opener Virender Sehwag has taken the banter to a whole new level with a hilarious TV ad for broadcaster Star Sports. The video for the upcoming series shows Sehwag ‘babysitting kids’ and ends with a quip to ensure the babies don’t leave stains at the end. Earlier, Aussie Test skipper Paine advised Pant to extend his stay in Australia while suggesting him to play in BBL and babysit his kids as MS Dhoni returned for India in the limited-overs squad. In response, the 21-year-old wicketkeeper called Paine a ‘temporary captain’ and later actually clicked a photo with his kids. Bonnie Maggs, Paine’s better-half, had posted a picture on Instagram where Pant was seen carrying both her children during an official event with the Australian Prime Minister. On being asked about the incident, both Paine and Pant heaped praises on each other. Australia’s campaign against India will start with a two-match T20I series Australia with the start of series which get underway on Sunday, February 24 in Visakhapatnam. Bangalore will host the second T20I. The ODI series starts on Saturday, March 2 and ends on March 13 with games in Hyderabad, Nagpur, Ranchi, Mohali and Delhi.